The trail to Mount Storm King’s summit threads through columns of pleasant, predominantly coniferous forest often swathed in clouds that frequent the mountain’s slopes. Mount Storm King Trail, December 28, 2015. 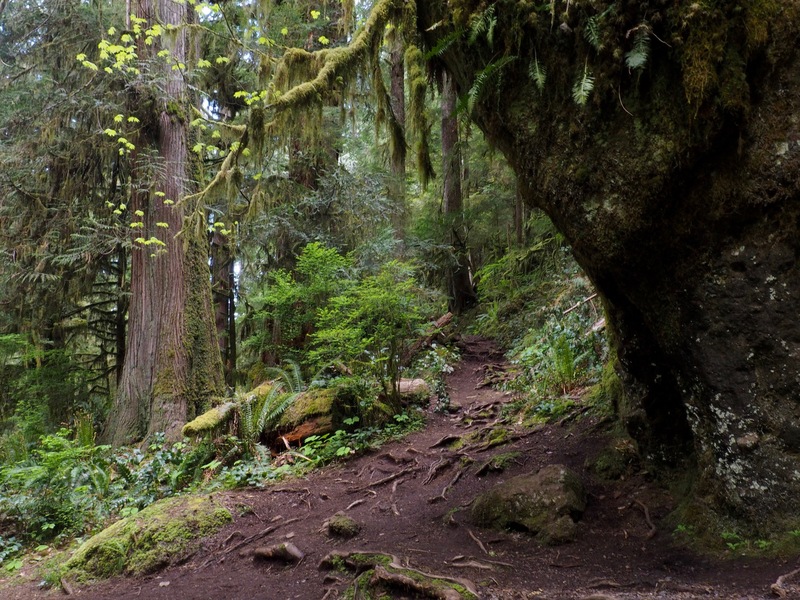 Mount Storm King’s short but steep trail begins within walking distance of Olympic National Park’s Lake Crescent Lodge and yet offers, among other features, a bit of solitude away from the consistent procession of visitors that bypass it in favor of the ever-popular Marymere Falls. 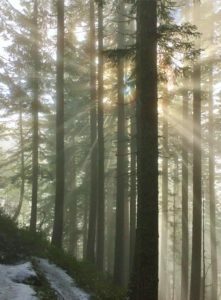 The trail is enclosed by mostly coniferous forest throughout its length, although a few rocky outcrops and parted boughs justify the climb with increasingly grand glimpses until the craggy summit is attained with views down Lake Crescent and up Aurora and Happy Lake ridges. Furthermore, an array of intriguing wildflowers accents the forest under- and middlestory in the spring and summer months. Although vehicle traffic far below on Highway 101 can sometimes be heard, the chattering rush of Barnes Creek, hidden from sight deep in the wooded valley riven on the mountain’s southern flank, is a near constant companion. The rigorous ascent, plentiful flora, and vertigo-inducing vistas are not the mountain’s only breathtaking features: views usually open where solid ground drops away just steps from the trail. Care should be exercised, especially with small children. Just over a half mile/0.80 km from the trailhead it shares with the Marymere Falls Nature Trail at the historic Storm King Ranger Station, the path up Mount Storm King branches left and decidedly upward at the foot of a massive boulder overhung with mosses, ferns, and vine maples (Acer circinatum). Mount Storm King Trail, May 20, 2017. A fine comb of conifers bristles about the trail until it reaches the summit. Mount Storm King Trail, December 28, 2015. Here and there, the forest parts to reveal southward glimpses of Happy Lake Ridge and the Barnes Creek Valley. Mount Storm King Trail, May 17, 2014. Despite Mount Storm King’s foreboding name, spring wildflowers abound across its face, varying as the trail progresses through subtly changing habitats ranging from the near-rainforest about its feet (lying in the rainshadow of the Olympics, this forest, albeit frequently cloud-drenched, is not technically rainforest) to the increasingly drier climes nearer its summit. Although not occurring in the lavish displays that frequently paint alpine meadows, the often diminutive woodland blooms nevertheless present the attentive hiker with an abundance of unique flower forms and growth habits to enjoy. Throughout the woodland, watch for blooms in many fanciful forms, including valerian (Valeriana sp.) (top left), Pacific trillium (Trillium ovatum) (center left), American twinflowers (Linnaea borealis) (center), pipsissewa, or, western prince’s-pine (Chimaphila umbellata) (lower left), chickweed monkey-flower (Erythranthe alsinoides) (lower center), and, likely, a Sierra pea (Lathyrus nevadensis) (right). Mount Storm King Trail, May 17, 2014 and June 18, 2016. Several loosely related species of the Orobanchaceae family of parasitic plants appear across Mount Storm King. Vancouver groundcones (Boschniakia hookeri) (left) and oneflowered, or, naked broomrapes (Orobanche uniflora) (lower right) possess no leaves or chlorophyll and live entirely off of water and nutrients thieved from the roots of nearby plants. Paintbrushes, such as the harsh paintbrush (Castilleja hispida) (top right) are hemiparasites and, although they have leaves that produce some of their own sustenance, also augment their intake from the roots of their neighbors. Mount Storm King Trail, May 17, 2014. Exposed outcrops along the trail not only open views beyond the forest’s boughs, but also nurture sun-loving flora, several of which are curiously related to domestic varieties found in savory dishes. The sand dune wallflower (Erysimum capitatum) (left) is a member of the mustard and cabbage family, Brassicaceae. Cascade desert-parsley (Lomatium martindalei) (top right) bears leaves resembling those of its cousins that garnish dinner plates and flavor sauces. Olympic onions (Allium crenulatum) (lower right) are one of many wild species related to edible and ornamental garden varieties of onions. Mount Storm King Trail, May 17, 2014. The star of Mount Storm King’s spring wildflower season is the western fairy slipper (Calypso bulbosa var. occidentalis), a native orchid species. Also known as “Hider-of-the-North” for its reclusive nature and irregular distribution (usually only in old-growth or otherwise long undisturbed forest), it is nevertheless populous throughout this mountain enclave from nearly bottom to top. However, resist the urge to pick or uproot the orchids for souvenirs, which nearly always kills them, as they are delicate in structure and dependent upon relationships with other species in their environment to survive. Western fairy slippers (Calypso bulbosa var. occidentalis) are named for their resemblance to smooth, ribbon-trailing pouches, although one can easily perceive distinct personalities in their jutting jaws and jaunty topknots. Most often sporting shades of lavender and magenta, western fairy slippers can also appear as pale as tawny white, especially as they age. Although they typically occur as solitary specimens, they sometimes form clumps, as demonstrated by the gaggle in the lower left photo gawking at their cliff’s edge view of Lake Cresent. Mount Storm King Trail, May 17, 2014. As the trail nears the summit, views soar across Lake Crescent’s azure waters, on a clear day reaching the Strait of Juan de Fuca and Canada’s Vancouver Island on the horizon. Mount Storm King Trail, May 20, 2017. On the far shore of Lake Crescent’s crook, Pyramid Mountain lifts its often cloud-wreathed head. Mount Storm King Trail, May 17, 2014. From Mount Storm King’s summit, Aurora Ridge appears nearly sky-borne above the cloud-flooded valley below. 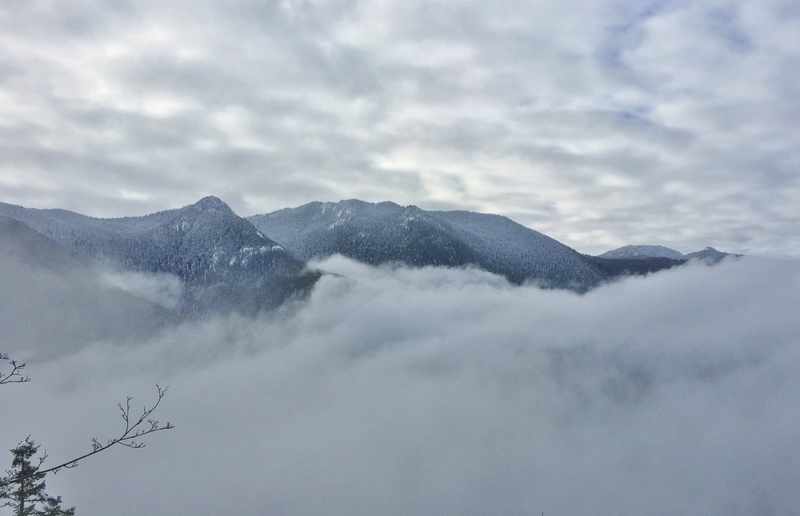 When views from the trail are shrouded, linger a bit – the roving clouds that frequently wreath Lake Crescent’s cradling mountains take flight as quickly as they gather, often leaving moments of crystal, sunlit clarity in their wake. Mount Storm King Trail, December 28, 2015. At its end, the trail peers down Lake Crescent’s longest arm (it is more fishhook-shaped than crescent-shaped), which stretches westward directly from the base of Mount Storm King. Mount Storm King Trail, May 17, 2014. Curiously, small, sun-loving succulents cling to the Olympics’ rainswept and often snow-capped peaks. Here, a troop of broadleaf stonecrop (Sedum spathulifolium) marches over a mossy knoll near Mount Storm King’s summit. Mount Storm King Trail, May 17, 2014. 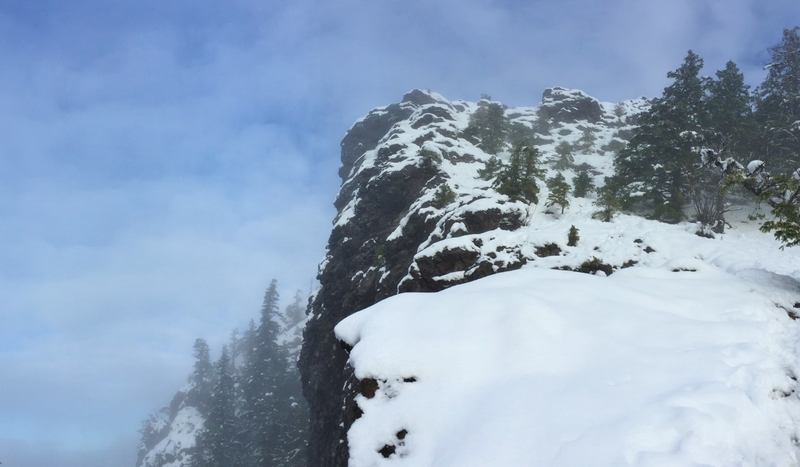 Perhaps recalling a former life’s more watery state, winter snow forms a wave-crested cornice on a trailside boulder near the summit. Mount Storm King Trail, December 28, 2015. In spring, spreading phlox (Phlox diffusa) cheerily occupies the mountaintop’s formerly snowbound niches. Mount Storm King Trail, May 17, 2014. At the trail’s end, the sheer-walled summit looms overhead. A rope has been anchored to the rock to assist those who wish to attempt the arduous scramble to the top. Whether by summer’s barren stone or winter’s draping snow, proceed farther with extreme caution — beyond the trail, there is significant exposure with no protection from the precipitous plunge at the summit’s abrupt western edge, which extends hundreds of feet (and meters) below the frame in this photo. Although rooted at relatively low elevation (700 feet/213 meters) not far from the Olympic Peninsula’s northern coast on the Strait of Juan de Fuca, Mount Storm King quickly rises to a height of 2400 feet/732 meters, crowned with snow easily reaching knee-deep or higher in winter months. Before setting out, be sure to check recent trip reports for up-to-date information on trail conditions. Mount Storm King Trail, December 28, 2015.